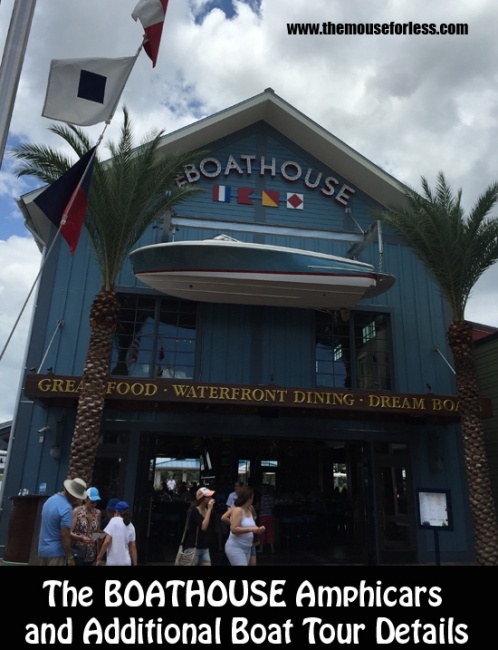 The BOATHOUSE at Disney Springs is the only place in the world that offers the unforgettable & thrilling experience of a Captain’s Guided Tour in a vintage and unique Amphicar. In addition, Guests can float on Water Taxis, which also will give Guests a tour of Disney Springs. These rare cars have the distinct capabilities to drive on land and then enter the water of the Sassagoula River, taking you on a fun-filled, 25-minute tour of the landmarks surrounding Disney Springs. The Captain Guided Amphicar tours are offered daily from 10:00 a.m. – 10:00 p.m. They cost $125 per car for up to 3 adults or 2 adults 2 children. Amphicar tours are weather permitting. To book your tour, call (407) 939-2628. Embark on The Venezia, a breathtaking 40-foot Italian Water Taxi, for a romantic Captain’s Guided Tour of Disney Springs, complete with chocolate-covered strawberries and a champagne toast. Guests can book The Venezia for either 30 minutes for $75 per adult and $50 per child under 13 years old or for 60 minutes for $115 per adult or $75 per child under 13 years old. The Venezia is the perfect setting for private events, anniversaries, engagements & other special celebrations. For private events, Guests may book The Venezia for up to 16 Guests for $1,700. Tours take place from 10:00 a.m. until 10:00 p.m. (weather permitting). Walk-up reservations can be made at the Ship’s Store, adjacent to The BOATHOUSE. The Captain Guided Wine Tasting Cruise takes place every Saturday at 6:30 p.m., aboard the Venezia Italian Water Taxi. Guests will be able to taste Prosecco upon boarding and taste 1 white wine and 2 red wines while taking the tour up the canal and past Disney resorts. On the return journey to the boat dock, guests will be able to choose one wine that they will be able to enjoy on the cruise back. Hors d’hoeuvres will include meat, cheese and fruit. Guests will also be able to take home a complimentary souvenir wine glass. Only 8 guests are able to go out at a time for the Tasting for 60 minutes. The cost is $125 per single or $225 per couple.